What is the Kumon Japanese Language Program? that you can use in various settings in your daily life and work. The grammatical skills and rich vocabulary, which you can gain by repeatedly reading and writing Japanese texts, will be helpful in every setting of your everyday life and work. For instance, this program will enable you to fill out documents requested by government offices or hospitals, to have good communication at work, to understand posters, signboards or guidance displays, and to read newspapers, and books. With some help written in your native language (English, Portuguese and Chinese), you will acquire Japanese proficiency by repeating the practice of listening to the audio material, reading worksheets and writing on your own. As you will start studying at the level equivalent to your current Japanese skills, you will be able to enhance your Japanese proficiency steadily at your own pace. The instructors of the Kumon Japanese Language Program will assess your learning progress and help you motivate yourself to improve, in addition to grading your worksheets and giving advice accordingly. The "class" course is for students who wish to study at a Center while the "correspondence" course is for those who are too busy to go to a Center and wish to study at home. Please choose the course that suits you best. You can study these worksheets in small steps on your own, with your native language (English, Portuguese and Chinese) used as the medium of instruction. 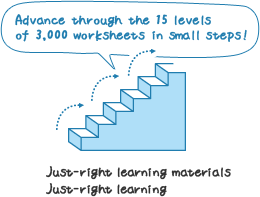 The worksheets of the Kumon Japanese Language Program are structured in 15 levels from Level 4A to L, with 3,000 worksheets that progress in difficulty in small steps. After completing the program, students can continue their study with the Kumon Kokugo Program (a program designed for native Japanese students). The worksheets are structured in 15 levels with a total of 3,000 worksheets. level to beginners, intermediate and advanced level! Click the image of each level to see the details.